What Does The Bible Say About Babylon? What Is Its Significance? Does Babylon have symbolic meaning for our day today? Does it have meaning for the future in prophecy? What is significant about Babylon for Christians today? As Isaiah continues, “It will never be inhabited or lived in for all generations; no Arab will pitch his tent there; no shepherds will make their flocks lie down there. But wild animals will lie down there, and their houses will be full of howling creatures” (Isaiah 13:20-21a). This prophecy has proven true and even today it is a wasted, barren land and only desolation is there. Babylon became proud but God brought her down to the ground because God always resists (literally is “at war with”) the proud but gives grace only to the humble (James 4:6). Babylon was anything but humble. Some scholars believe that the name Babylon is derived from the Akkadian name “babilani” and is translated “the gates of the gods.” This was not a tribute to the God of the Bible but to false, pagan gods, which of course are not gods at all but in actuality, the name “babel” sounds like the Hebrew word for “confused” so either way, whether it was associated with false gods or that it meant confusion, what is important is that when all the people of the earth came together, they intended to build a city up to heaven itself. Almost immediately after the flood in Noah’s day, mankind had only one language and “And as people migrated from the east, they found a plain in the land of Shinar and settled there. And they said to one another, “Come, let us make bricks, and burn them thoroughly.” And they had brick for stone, and bitumen for mortar. Then they said, “Come, let us build ourselves a city and a tower with its top in the heavens, and let us make a name for ourselves, lest we be dispersed over the face of the whole earth.” And the Lord came down to see the city and the tower, which the children of man had built. And the Lord said, “Behold, they are one people, and they have all one language, and this is only the beginning of what they will do. And nothing that they propose to do will now be impossible for them. Come, let us go down and there confuse their language, so that they may not understand one another’s speech.” So the Lord dispersed them from there over the face of all the earth, and they left off building the city. Therefore its name was called Babel, because there the Lord confused the language of all the earth. And from there the Lord dispersed them over the face of all the earth” (Gen 11:2-9). What is important is that they wanted to build a city with “its top in the heavens” which could mean that they wanted to overtake or usurp the authority of God or the gods. God saw where this was leading to so He came down and confused their languages and caused them to be dispersed. Many however remained and they continued to build, not the tower of Babel, but a city called Babylon. It rose to be the supreme power in the world and as usually happens, with power comes pride and corruption and thus God would later send the Medes to destroy her but apparently she would rise again but this time in a different and decidedly more dangerous state. Today, we can read about the ruins of Babylon but in essence, there is a spiritual Babylon today. 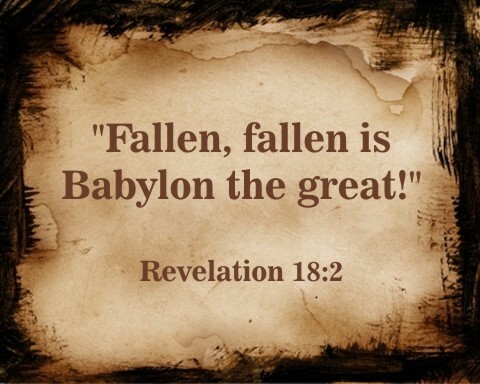 In Revelation 18:2-3 an angel of God is sent to the earth and proclaims that Babylon is “Fallen, fallen is Babylon the great! She has become a dwelling place for demons, a haunt for every unclean spirit, a haunt for every unclean bird, a haunt for every unclean and detestable beast. For all nations have drunk the wine of the passion of her sexual immorality, and the kings of the earth have committed immorality with her, and the merchants of the earth have grown rich from the power of her luxurious living.” When Babylon is said to have “fallen, fallen” this may indicate that another Babylon-type, an economic giant, will arise in the end times or perhaps it is now arisen and is already part of the world’s system, but to say it is fallen twice means that there was the first fall of Babylon that Isaiah prophesied by the Medes and then in the latter days, she will fall once again. In the wake of this, God sends a warning to His people and says “Come out of her, my people, lest you take part in her sins, lest you share in her plagues; for her sins are heaped high as heaven, and God has remembered her iniquities. Pay her back as she herself has paid back others, and repay her double for her deeds; mix a double portion for her in the cup she mixed. As she glorified herself and lived in luxury, so give her a like measure of torment and mourning, since in her heart she says, ‘I sit as a queen, I am no widow, and mourning I shall never see.’ For this reason her plagues will come in a single day, death and mourning and famine, and she will be burned up with fire; for mighty is the Lord God who has judged her” (Rev 18:4-8). Why might I say that Babylon is a type of world, economic system? Because in Revelation 18:11-13 the whole world mourns when she falls because “the merchants of the earth weep and mourn for her, since no one buys their cargo anymore, cargo of gold, silver, jewels, pearls, fine linen, purple cloth, silk, scarlet cloth, all kinds of scented wood, all kinds of articles of ivory, all kinds of articles of costly wood, bronze, iron and marble, cinnamon, spice, incense, myrrh, frankincense, wine, oil, fine flour, wheat, cattle and sheep, horses and chariots, and slaves, that is, human souls.” We see that this is a gigantic, world-wide economic system that is to control much of the global economy and when she falls, so too will many of the nations who depended upon her for wealth. What is even more chilling is that Revelation 18:13 says that she markets “slaves [and] human souls” which could mean human trafficking or a slave market which already exists in many parts of the world today. When Babylon falls again, the rich will weep (Rev 18:19) but the righteous saints of God will rejoice because God has finally judged this economic and godless beast (Rev 18:20). Babylon, like every person who has ever refused to repent and trust in Christ, will be utterly destroyed (Rev 18:21-24) but this will be followed by great shouts of “Hallelujah! Salvation and glory and power belong to our God, for his judgments are true and just; for he has judged the great prostitute (Babylon) who corrupted the earth with her immorality, and has avenged on her the blood of his servants” (Rev 19:1-2). Today, you can come out of her and be spared the wrath that God intends to pour out on her. If you delay, then the Lord’s coming may hasten your utter destruction along with the harlot and then it will be too late to repent and trust in Christ. Today is the day of your salvation (2 Cor 6:2) for tomorrow may be too late. More reading: What Does the Bible Say About Pride? Thanks Doc….always the Barnabas and I truly do thank God for you sir and thanks for the visual aid. That’s awesome.